The striking taxi drivers of Madrid have refused the government's offer of spatial regulations for VTC services and are seeking stricter regulations. Taxi aggregators Uber and Cabify recently announced their withdrawal from the Catalan city of Barcelona after the imposition of stricter regulations by the provincial government on Vehicles for Hire (VTC) services operated them. The Catalonian government introduced these regulations in the aftermath of a taxi strike in the city. Taxi drivers in Barcelona began their strike two weeks ago, demanding stricter regulation of contractual licences for VTCs, operated by ride-hailing apps such as Uber, Cabify, Moove, etc. Later, taxi drivers in Madrid also joined the strike, blocking roads, etc. Several demonstrators got injured during clashes with the police. Drivers in Barcelona ended their strike last week after the Catalan government offered new rules, forcing customers to book ride-hailing services 15 minutes to an hour in advance. Reports say that the Madrid authorities are not convinced by such a move and are proposing “spatial” regulations, meaning that the VTC vehicle would have to be at a certain distance from the customer at the time of booking. But the Madrid drivers are in no mood to agree to such proposals and have intensified their strike. They also protested at the FITUR International Tourism Trade Fair held in the city. Reports also emerged about a simmering conflict between taxi drivers and Uber drivers at places with Uber cabs with passengers being attacked by protesters. Meanwhile, the taxi drivers in Madrid intensified their strike amid the blame game between major political parties in the country. The Gremial Taxi Association (AGATM) recently called for continuation of the ongoing hunger strike and other mobilizations, demanding the regulation of the VTC contracts operated by Uber and others in the city. They also proposed amendments in the existing legislations regarding different modes of transport in order to make a coherent regulatory framework. 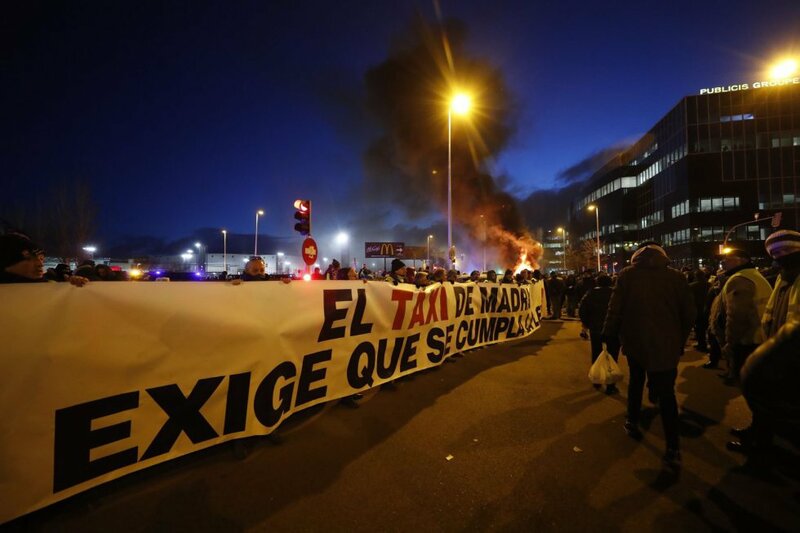 The Elite Taxi Association, Madrid, asserted that the “government of Angel Garrido in Madrid is not willing to give up its attitude and is putting the lives of more than 20,000 people, who are economically having serious problems, at risk”. 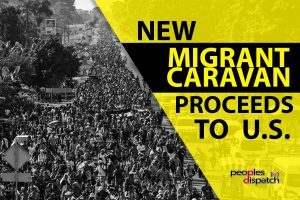 Last year, in the wake of a similar protest, the central government, led by the PSOE (Spanish Socialist Workers’ Party), put the onus of solving such issues on provincial governments. Now, Madrid’s provincial government, led by the Popular Party, has blamed the the central government for their incapacity to solve the problem and used this opportunity to take a dig at the Catalan government which had agreed to the demands of the taxi drivers in Barcelona. The Communist Party of the Peoples of Spain (PCPE) expressed their solidarity with the taxi drivers in their fight against the big companies in the VTC sector and the governments that bend to their interests. Meanwhile, the VTC union, Unauto, denounced the regulations enforced by the Catalan authorities and urged Madrid not to succumb to the pressure mounted by the taxi drivers. “Unauto VTC, the association that represents 90% of the sector in Spain, has asked the president of the Community of Madrid, Ángel Garrido, not to give in to the threats of the taxi sector to block Fitur. The association has once again requested that a dialogue process be created to reach an agreement that puts users at the center of the equation, and that it respects the 10,000 jobs that the sector generates in the Community of Madrid. Unauto VTC has once again requested that there be no hasty and unjust regulation to satisfy the demands of the taxi,” their statement read. According to a report by Ramon Munoz in El Pais, the number of taxi licenses has remained the same for more than 20 years – 70,000 across Spain (69,972 according to the most recent data from the National Institute of Statistics) – even though the population of Spain has grown by seven million people. The same thing has happened with VTC licenses. After the first permits were released (9,366 that are now operative and another 7,000 that recently came out on the market through court orders), the VTC industry association Unauto, which represents 80 businesses including Cabify, Moove and Uber, no longer wants any more to be offered. Experts say that the Spanish authorities’ hesitation to issue new taxi permits and licenses could be a factor that affected transport in the cities in the wake of the drivers’ strike. The limited availability of permits in both the taxi and the VTC sectors has also led to a huge black market for these permits. Hey Buddy!, I found this information for you: "Uber and Cabify withdraw from Barcelona after govt. imposes new regulations". Here is the website link: https://peoplesdispatch.org/2019/02/03/uber-and-cabify-withdraw-from-barcelona-after-govt-imposes-new-regulations/. Thank you.